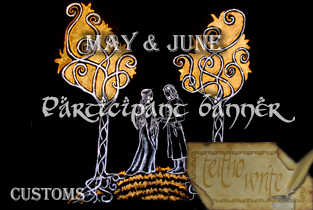 Our theme for May and June is Customs. They are defined as cultural ideas — a patterned way of behaving that is considered characteristic of a social system. Customs regulate social interactions. Do you shake hands, bow or kiss when greeting someone? Customs or traditions are unwritten ways of doing things, handed down from one generation to another. They vary from society to society and differences in customs can create confusion, unintentional faux pas or even conflict. How do customs figure in Tolkien’s work? The Hobbits have a custom of giving gifts on their birthdays, rather than receiving them. Faramir and his men take a moment of silence and look to the West before meals. Dwarves do not share their secret names with others. Finwë’s uncustomary second marriage set off a sequence of events that eventually led to the Exile of the Noldor. How do customs vary among the races and cultures of Tolkien’s world? What are some obscure customs that might surprise us to learn? Are some customs shared among the inhabitants of Arda? Do some customs lead to humorous confusion or embarrassment in those that are unfamiliar with them? Or do they lead to conflict and misunderstanding? How did these customs develop? How or when did some custom first start? How might one society’s custom be misinterpreted by another? The possibilities are endless — show us how customs differ among the inhabitants of Middle Earth. Or how they are the same. Or how some of our beloved characters may have offended and incensed those around them. Or caused great confusion or hilarity. It’s your choice!